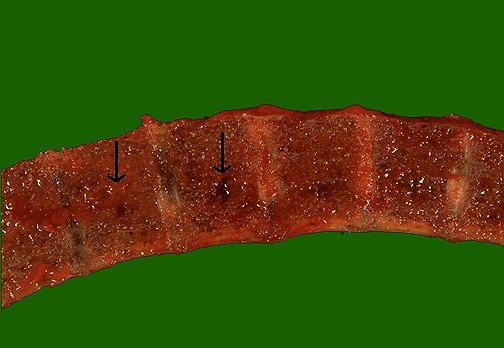 Round lesions filled with a soft reddish material are indicative of foci of myeloma in this section of vertebral bone. Larger lesions may weaken the bone to cause fracture with back pain. Question: What is the name for this type of fracture? Answer This is a 'pathologic fracture' and the bone becomes so weakened that it may break without any trauma.